Research scholars from various leading institutions on Friday held a nationwide protest demanding a hike in stipend. The protest demonstration was held in campuses and in front of Department of Science and Technology (DST) in Delhi. The scholars have further threatened to approach the Ministry of Human Resource Development (MHRD) if their demands are not met. Students came from prominent institutions like IISc Bangalore, IITs, Defence Research and Development Organisation (DRDO), and Institute of Nuclear Medicine & Allied Sciences (INMAS) indicating their discontent with the government’s lack of sensitised response. 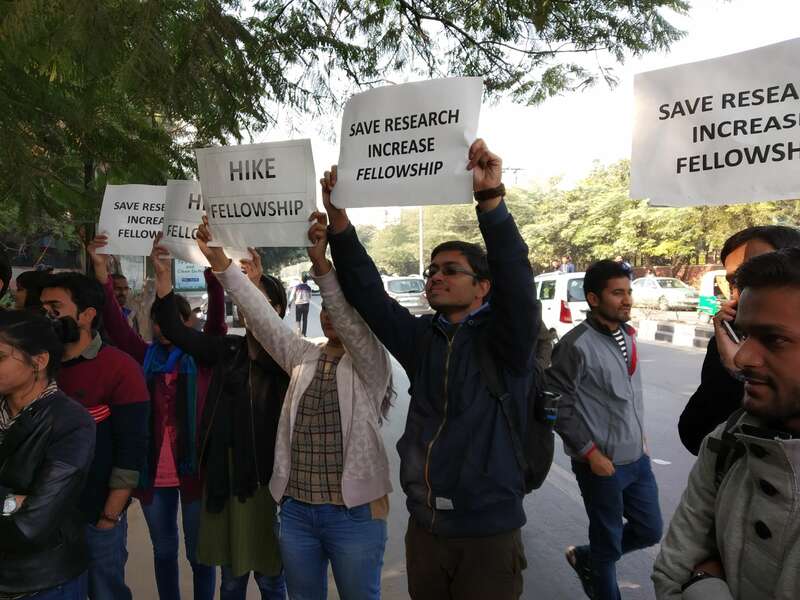 Disgruntled with the irregularity in disbursals, research scholars have also demanded a web-based fellowship assessment portal and a centralised regulatory body for regular evaluation of fellowships to suggest periodic changes. Slogans such as, “We are demanding our rights, not begging for money,” soon followed. Protesters have threatened to go on hunger strike if their demands aren’t met with an appropriate response.